Deck Construction, Home Additions & Basement Finishing | Carver Construction Inc. Carver Construction - Building in Minnesota Year-Round! We know that hiring the right residential contractor can be a difficult and trying process. Carver Construction is committed to making your home construction project an easy and enjoyable one. We strive to ensure that our projects are completed in a timely manner and to the highest standards. Our expertise extends from building all-season, maintenance-free custom decks and porches to creating beautiful living spaces such as finished basements. Our goal is to provide custom home design and construction plans that best fit the architecture and individual style your home. 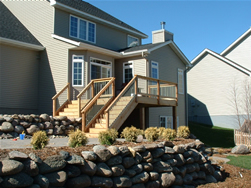 We serve the Minneapolis and St.Paul areas, as well as Lake Minnetonka and Six Mile Creek and specialize in residential construction, remodeling, basement refinishing, additions and deck projects of all sizes. Please enjoy exploring our website and learning more about how Carver Construction can meet your home construction project needs! Call us today at (763) 458-0954 for a free estimate, or fill out our Contact Us form and a representative will contact you within 24 hours.